Energy Efficiency in Air Transportation explores the relationship between air transportation and energy use, starting with an analysis of air transport energy sources and their potential development. 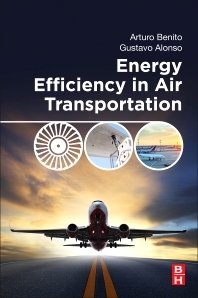 The book examines how different elements of the air transport system make use of energy, with an analysis of various methods for optimizing energy consumption. The book covers the consequences of energy use in terms of economics, environmental impact and sustainable development, with a review of the existing and proposed regulatory measures addressing those factors. Aeronautical and air transport engineers interested in aerial vehicle systems design, as well as public administrators and regulators concerned with energy efficiency or environmental issues in air transport, will benefit greatly from this comprehensive reference, which captures necessary background information along with the newest developments in the field. Doctor Aeronautical Engineer (U. Politécnica de Madrid), Graduate in Journalism (Escuela Oficial de Periodismo de Madrid) and Graduate in Civil Aviation Management (London Business School). From 1970-2006, Prof. Benito has worked for Construcciones Aeronáuticas, S.A, (now Airbus-Spain) and for IBERIA, Airlines of Spain. Currently, Prof. Benito is Head of the Air Transport Department in the Universidad Politécnica de Madrid, a member of the Board of Air Business Academy (Toulouse) and ICAO consultant for Air Transport subjects. He is a member of the European Union Clean Sky 2 Scientific Committee and the X-Noise Advisory Board programs. Nowadays he is an Advisor of Spanish Civil Aviation Authority on Environmental matters and represents Spain in WG3 (emissions) and GMTF (Market Based Measures) of ICAO’s Committee on Aviation Environmental Protection (CAEP). Dr. Alonso is currently a Professor and Deputy-Director at Technical University of Madrid, Faculty of Aerospace Engineering (ETSIAE/UPM). He lectures at graduate and post-graduate levels on various topics such as Air Transport Management and Aerospace Engineering. He is also involved in the organization and management of different courses and seminars and a visiting professor at several Universities.